Expecting your second child is a wonderful time for families. Amidst all the excitement of expanding your family, don’t forget to adequately prepare your first-born for the change. You may picture your two children becoming the best of friends, but to your first-born may see it as competing for parent’s attention. If you prepare your first-born for the new baby, they will start to become excited for the new one to arrive. Inform your child about your pregnancy before you tell friends and families. Even if you don’t think your child will completely understand, try to communicate that they will have a brother and sister. You don’t want someone else to bring up the new baby to your child first. If your first-born is 1-2 years old, the concept of a new baby might be over their head. The reality of having another baby in the household may be hard to imagine until the baby is born. For children older than 3, you can be more specific about what life will be like with a brother or sister. Do not explain the baby as a new playmate because your child will picture a friend right away. Communicate that the baby will mainly be sleeping, crying and feeding at first. Once you have communicated the pregnancy with your child, you will have a couple months to help them understand. • Start by looking through your child’s baby book and showing them pictures. They will start to understand that they were a baby once and required special attention. • Visit family and friends who have babies. Seeing their parents interact with a newborn can prepare them for the future. If they are old enough, your child can practice holding the baby. • Have your child interact with the baby while still in your belly. While the baby is kicking, have the child feel your belly. Invite your child to talk, read, or sing to the baby as well. • Talk positively about the baby during your pregnancy. Even if you feel tired, crabby, or nauseous, contribute it to not feeling well while talking to your child. Your child will blame the baby if they thing he/she is making their mom sick. • Have Dad or other caregiver, put in extra time with your first-born. Establish fun activities that they enjoy doing together. Most dads or second caregivers will spend more time with their first-born while the mother is with the baby. Your child view activities with Dad as pre-established routine. • Once the baby is born, do not expect your oldest child to be completely fine with a new child in the mix. They may regress, have tantrums, or become jealous. These behaviors are normal for children so be comforting and calming for them. • To avoid jealousy, be sure to carve out one-on-one time with your oldest child. • Prepare your friends and family members to show extra attention to the oldest child during visits as much as the baby. Don’t just talk about the baby and them being an older brother and sister. • Keep routines the same, especially bedtime routines. If you are concerned that your child’s routine is too long to continue, consider changing it months before the new baby arrives. Every first-born child reacts differently to a new sibling. Remember to be comforting to your first-born and keep them involved in your day. If you are having a difficult time with your first-born after the baby arrives, contact Lumiere’s Children Therapy for a consultation with our clinical social worker. Holcomb, Michele. "Preparing Your First-born for a Sibling." Today's Parent. N.p., 1 Sept. 2009. Web. 22 Nov. 2016. 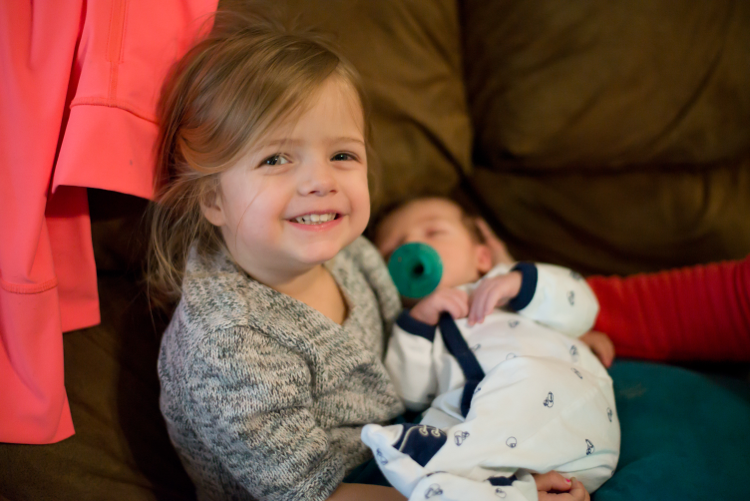 "Preparing Your 2-year-old for a New Sibling | BabyCenter." BabyCenter. N.p., 2016. Web. 22 Nov. 2016.